Everyone loves a great curry, but not everyone loves spending all day in the kitchen toasting spices and prepping vegetables. Somewhere between delivery from your favorite curry house and making your own Garam Masala (which everyone should do once), there must be a shortcut. Let’s talk about how to make an awesome vegetarian curry in under an hour. There are a lot of kitchen shortcuts for curry, and not all of them are that great. 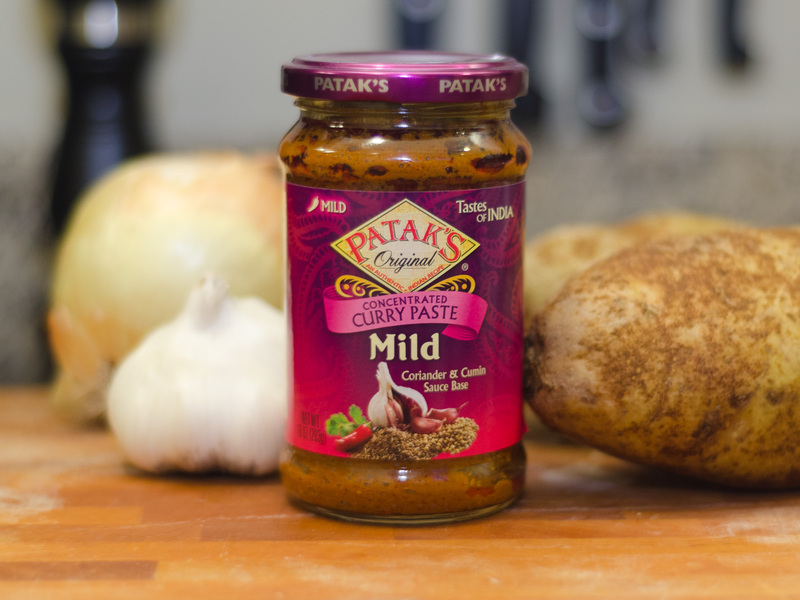 One that I’ve discovered that doesn’t taste pre-prepared is a line of jarred spice pastes from Patak’s. There is a ton of flavor locked up in theses jars and they aren’t overly spicy. Starting with a good paste can save over an hour that would be spent cooking down garlic, ginger and onions into a rich base with your various spices and Garam Masala. The back of the jar for their Mild variety has a basic recipe which I’m going to tweak, and do a little out of their sequence, for what I think is a more authentic result. In addition to using the paste, I can make up time by pre-cooking the potatoes and coarsely chopping vegetables. The potato 2-step, similar to what I do to ensure crispy oven roasted potatoes, involves cooking them partially first in the microwave. Trying to do so in the simmering curry sauce will take far too long. Additionally, since I’m going to be blending the sauce later, I don’t need the vegetables to be super finely chopped. Of course you could meat this up as well with chicken, beef or pork. Lentils would also be great in place of the potatoes. If you like Indian paneer cheese, you could add it in just before serving so that it’s just warmed and gooey. Finally, I like to serve this with medium grain brown rice (nice and chewy, less plain than long grain brown) and naan bread. 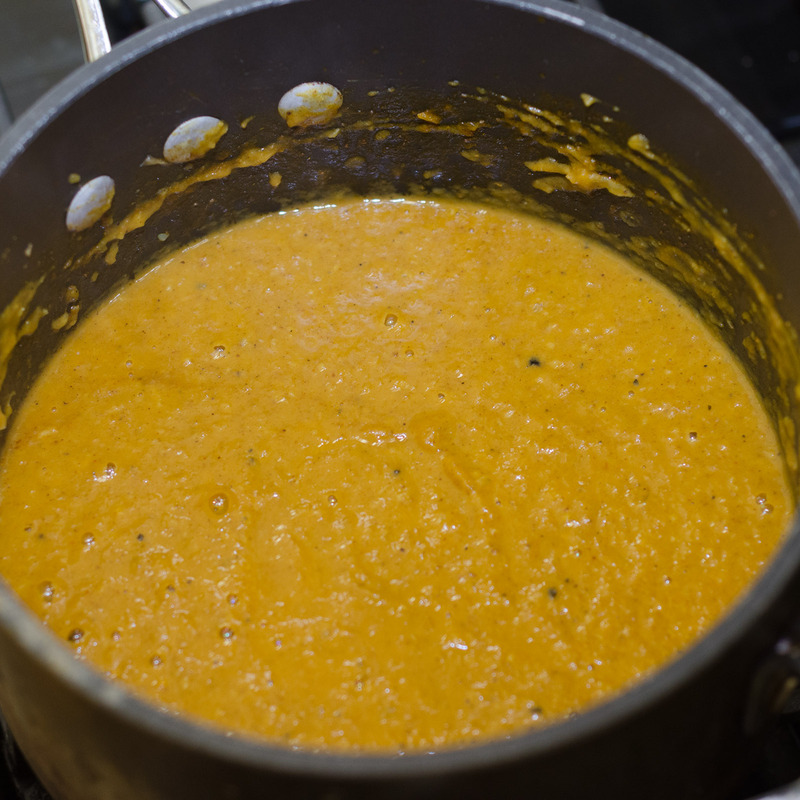 The curry paste is rather thick, so I dissolve it in 1/2 cup of the water. Once dissolved, pour it into the pan with the remaining 1 cup of water. Bring this to a boil, reduce and simmer for at least 30 minutes. I am so going to try this recipe! Perfect for winter! 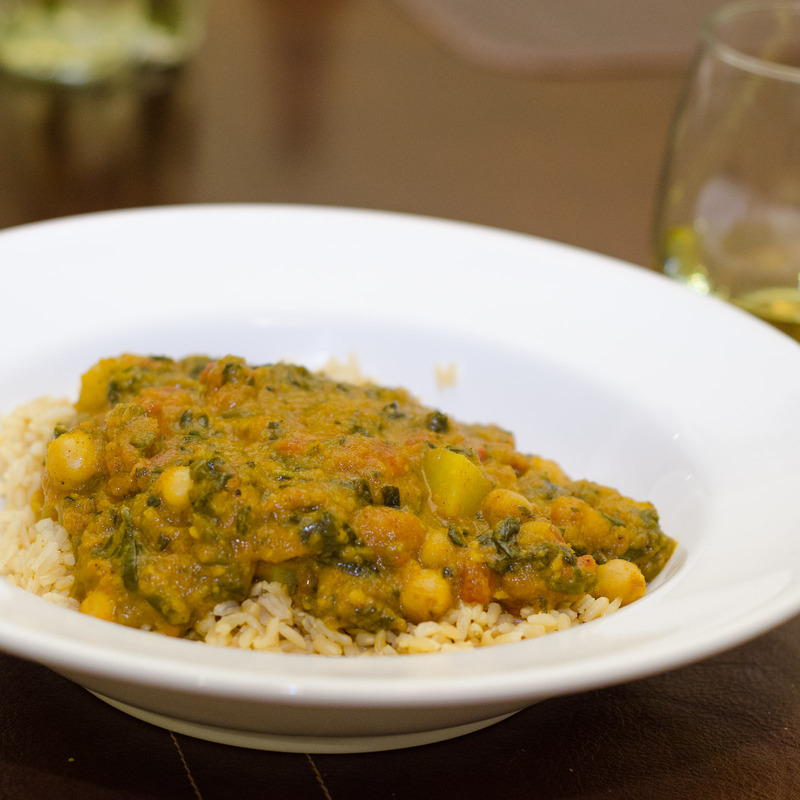 I love curry and I personally make a chickpea curry with potatoes too (potatoes and aubergine) that it's very yummy. It must be delicious with spinach (I love spinach!). This looks SO good. I am going to give it a try this weekend!